My inspiration comes from my educational background, through my time in the clinical area I gained a lot of experience working with EKGs in the ER and seeing defibrillators in action. After seeing that AEDs are hard to find outside of hospitals, and ones that are found may come with a list of problems from missed inspections, busted batteries, and missing pieces. So we decided to create our own take on the AED, and we're calling it JumpStart. 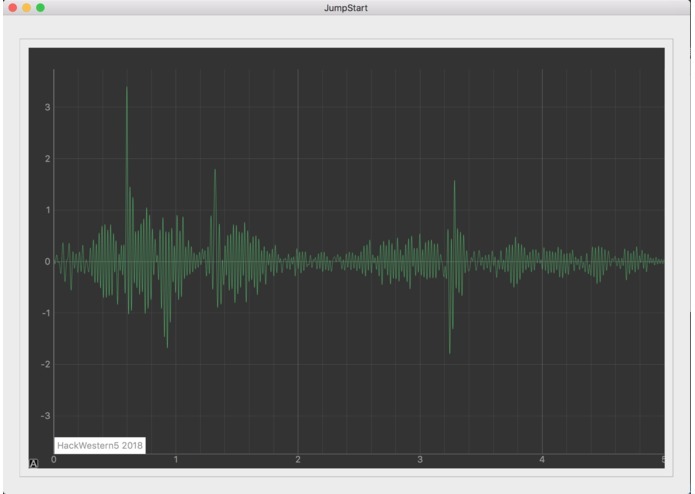 By building an EKG to sense for one of the two shockable heart rhythms, JumpStart uses an external battery phone case to deliver a shock in an attempt to re-establish sinus heart rhythm. The app was built using python and the pyaudio and scipy/numpy/matlib scientific libraries, and an arduino+breadboard to attach our makeshift electrodes and measure electrical pluse. Using the microphone input on the computer, the arduino sends the frequency of the heart's electric potential over the aux cord, which the computer reads as audio. Using some amplification, lowpass filtering and volume adjust, we eliminated most of the electrical noise to present the heart's rhythm. Rest of UI and graphing is made with Qt. the fact that I was able to make a functioning ECG out of spare parts and analog tool. Code hard, go hard. Swag is cool, electrical heart activity is cooler. Get out there and start saving lives! I worked on the python code and some of the algorithms to filter out the noise. The identification of vtak is also done to enable the use of shocking. Wired the board and circuit.